One of the biggest complaints about ditching the cable bill is how to watch sports without cable. The cable companies have held a monopoly on this for years, but things are changing. There are several ways that you can still continue to watch sports online without a cable subscription. Using a combination of an over the air antenna and streaming services, you can still enjoy many sporting events. The first step is to buy an over the air or HD antenna. Many sporting events are still broadcasted on the major networks like NBA, CBS, FOX, and ABC. All of these stations and more are available by installing an over the air antenna. HD antennas are easy to use and install. Next, you will need to find a streaming package or service to watch games that are not broadcasted using an over the air signal. There are many different choices depending on what types of sports you want to watch. I have broken down these services into categories by the type of sports that can be viewed. You can watch many NFL games using an over the air antenna. If you want access to all the games, then you will need a service that will provide that for you. Sling TV allows you to watch ESPN, ESPN2, Fox Sports and many more channels for $20 a month. It works just like any other streaming service. You can download the app to just about any device. You can try it for free for 7 days. Sling TV pairs very well with a Roku box or the Amazon Fire TV. Update: There are more options to watch live sports. We have written a comprehensive article discussing the live TV streaming options that are becoming available to watch cable TV and sports channels. See the link below. NFL Game Pass has replays of all 256 regular season games-on-demand for $99 a year. They also offer live home and away radio broadcasts of every NFL game. You can also relive games from 2009-2016 season including past Super Bowls. This service is an excellent way to follow your favorite NFL teams anywhere. NFL Game Pass can be streamed on many devices. There are several ways you can watch NBA games online. Sling TV also allows you to watch ESPN, ESPN2, TNT and TBS for $20 a month. You can catch most games this way. NBA League Pass is the official streaming service of the NBA. They offer most NBA games. The one drawback is they do blackout games in your local area. This is because your local network has exclusive rights to broadcast the game. If you are an NBA fan and like watching most games this may be a good choice. 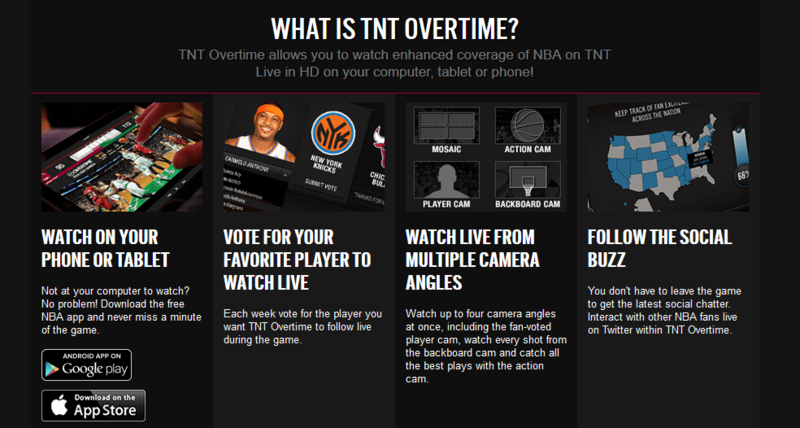 TNT Overtime streams many NBA games to a computer, tablet or phone for free. It offers 4 different angles to view the games all in HD. It is worth checking out. It is a fun way to watch an NBA game. It gives you a different perspective on the game. MLB.tv is the official streaming service for Major League Baseball. They offer all home and away broadcasts of 2,430 games for a yearly fee. You can choose monthly or yearly packages. You can also just follow your favorite team. They support over 400 devices with HD quality video. Be aware that some games are subject to local blackouts in your area. FuboTV is a streaming service that bundles live sport and entertainment channels, featuring live soccer matches, club videos, series, documentaries, and news. The service can be accessed via TVs, tablets, mobile devices and desktop computers. With Fubo PRO you can watch live matches from La Liga, Serie A, MLS, Liga MX, Ligue 1, Primeira Liga and the Brazilian Serie A through the live channels beIN Sports, Univision Deportes, UniMás, GolTV HD, Sport TV Americas and Benfica TV. You’ll also have access to several other championships, including the Copa America, Copa America Centenario, CONMEBOL, Football League Championship, English League Cup and Swiss Super League. Many of these matches will also be available on-demand through their DVR feature. For just $14.99 a month you can start watching all your favorite soccer matches. ESPN 3 is free for most people with an internet connection provided by a major service provider. Just select your provider from the list and you can start watching HD quality games. You can watch many soccer games like the World Cup and UEFA Euro. I am a big fan of the Netherlands National team. Go Orange! I am able to catch many of their qualifying games all year long. I also watch most of their World Cup games as well. NHL.tv allows you to watch home and away games of your favorite teams. All games are in HD. They also have DVR controls that can pause and rewind games. You can watch up to four games at one time. They have a nice selection of archived games. NHL.tv is also subject to blackouts in some areas. See the schedule for blackout information. College Sports Live will let you stream over 100 school games with exclusive coverage and DVR functionality. They have over 30 different Men’s and Women’s sports. They feature 15,000 live events per year and NCAA Championship coverage. College Sports Live has thousands of on-demand clips and exclusive content. They provide live video and audio coverage of non-televised events. College Sports Live streams to any connected device. ESPN 3 also has many different college games and events from all over the country. They have a nice function that allows you to see what upcoming games are being featured. It is free for most people if your internet service provider is on their content list. Definitely worth checking out. UFC Fight Pass allows you to watch Live UFC Fight Nights as well as popular shows like UFC Unleashed, Best of PRIDE and The Ultimate Fighter. You also have access to special interviews, original programming and their MMA video library. UFC Fight Pass can be streamed to any device. UFC Fight Pass is free to try and then requires a monthly fee of $7.99 a month. If you are an MMA fan this is a great choice to catch all your favorite UFC fights. The Fight Network is a channel that is dedicated to all things MMA and UFC 24 hours a day. They also have WWE wrestling coverage, programming and interviews. CBS Sports offers free live coverage of golf events. They broadcast many of the major golfing events. You can check their schedule to see what is streaming. With PGA Tour Live watch exclusive live coverage of the best players in the world. For about $6.00 a month you get exclusive live PGA morning coverage of Thursday and Friday events. You can watch on just about any device. Update: Many of the major networks like NBC, ABC, CBS and FOX are offering free live streams through a browser or device. See link below. It is possible to watch sports online without a cable subscription. Some of these options are free and some require a monthly fee. The best way is to buy an HD antenna and supplement it with some of these streaming options. Cord Cutters looking for free sports with no subscription, The Livestream app has The Patriot League, Mountain West Conference, WAC for free multiple sports. Download the app to your tablet or Roku, Click search, Type in sports. Also, On your YouTube account, Click Live and they have live streams of multiple sports for free. I have been looking for a way to watch cricket matches on my computer or tv but not have to pay for a large fee to do it. You mention NFL and NBA etc and soccer but make no mention of being able to catch some of the games from other countries which broadcast cricket. Any suggestions? I do have a sling btw. Looks like Sling TV International has sections of on demand and live cricket matches. Looks like your best option. Maybe other readers can comment on what they use to watch cricket matches.